It’s been a while since I wrote a Playlist Recommendations post (almost a year…yeesh) but I’ve still been doing the Monthly Playlists. I’ve organized the past year into seasons (winter, spring, summer, and fall), a tip I picked up from one of my favorite people to follow on Spotify: Allie Brown. I’ve known Allie for a long time and she is someone I consider both a close personal friend and a trusted professional colleague. She’s also got badass taste in music and a knack for putting together awesome playlists. I’ve raved about her playlists on Facebook too, but it seems fitting to bring the Playlist Recommendations series out of retirement and put it in a post. The Feel Good playlist in particular is exceptional. Everything from The Wire by Haim (a song I randomly never seem to get tired of hearing) and Diane Young from Vampire Weekend to Sugar, Sugar from The Archies and You Make My Dreams from Hall & Oates. Good-for-any-mood tracks from Two Door Cinema Club, The Fratellis, Arcade Fire, Bronze Radio Return, and Local Natives fall right in the category of “I love that song!” without actually being able to remember the name of it. Love the mix of familiar but also super indie bands, Architecture in Helsinki, Fleet Foxes, Generalists, Dale Earnhart Jr. Jr., Wilco, and Edward Sharpe & The Magnetic Zeroes. Solid length too, 70 songs almost 4.5 hours of great consistently Feel Good mood music. I threw this one back on when I had to work on a Sunday…helps make the best of a stressful week. 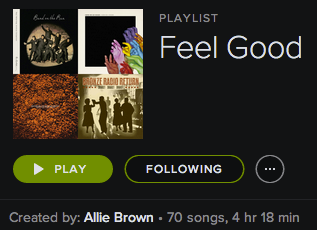 Download the Feel Good playlist here or subscribe to Allie’s other playlists here. For a random song to try that I think you’ll like, Anne sent me Big Red Neon Love by Sticky Monkey and it’s awesome. Hits every pop music stereotype but in a way that makes for a really fun track. Check it out!